The lovely folks there kindly sent me their chopped garlic, smoked garlic, chillies and ginger to try and at 0sp a serving, I knew they wouldn’t last long in my kitchen. I’ve since used all four jars completely and have found that they have become a bit of a staple in my cupboard. This recipe uses their chopped garlic and chopped red chillies. I love both of these as not only do they speed up the cooking process, but they also avoid getting the dreaded garlic smell on your fingers when chopping it! This recipe is a vegetarian recipe which is packed with flavour and texture and requires minimal chopping and cooking. 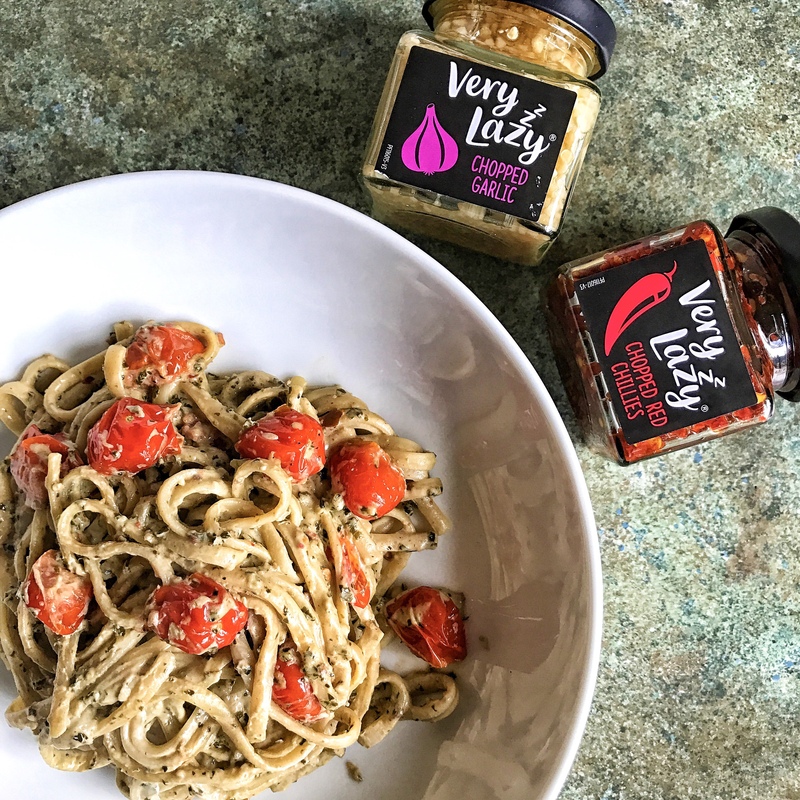 The pesto can also be made in advance and kept in the fridge overnight to make the whole cooking process even quicker – perfect for an easy mid-week dinner! 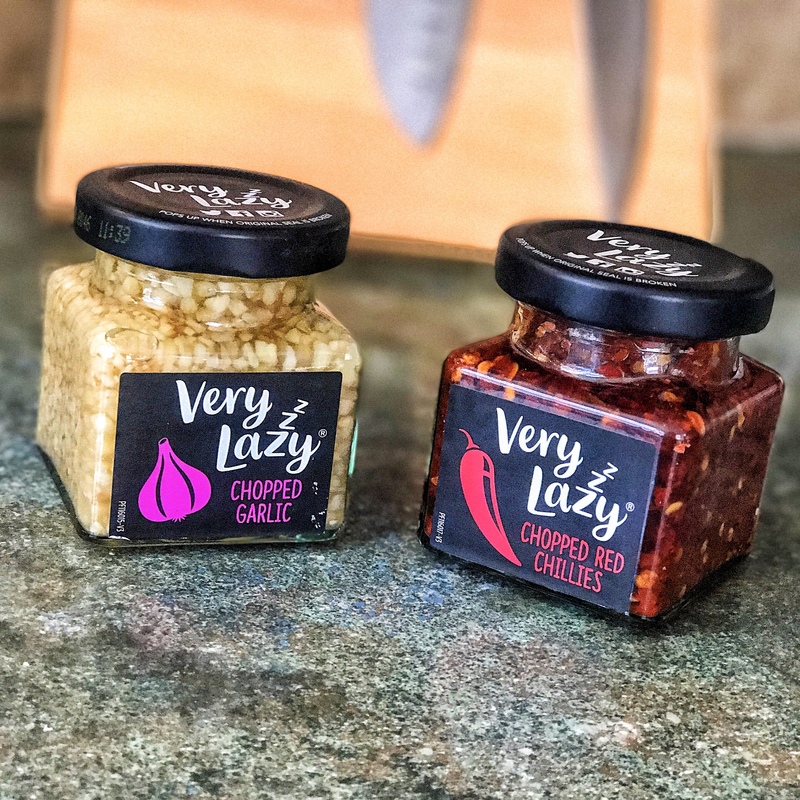 You can see the full selection of Very Lazy products over on their website http://www.verylazy.com/ and you can purchase their products in most major supermarkets. Watch this space for another recipe I’ve created using their Very Lazy ginger and smoked garlic! Put the walnuts in a dry frying pan and fry until toasted (this should just take a few minutes). Once cooled, add to a food processor and whizz until crumbs. Then add the rest of the pesto ingredients to the food processor and whizz everything together. Finally add the juice of 1 lemon and then add a few drops of cold water until you have a nice pesto texture. Pop the pesto to one side. Pop the pasta on and cook according to the packet instructions. In the same frying pan, spray with 1kal and the cherry tomatoes and spring onions, seasoning with salt and pepper. Fry for a minute until the tomatoes start to soften and then add the pesto to the pan and combine. Reduce to a lower heat and then add the crème fraiche. Stir to combine and then add a little cold water here and there to loosen the sauce. Once the pasta is cooked, drain (retain a little of the pasta water). Add the pasta to the sauce along with the spinach and toss everything together. Simmer for another minute or two to let the spinach wilt. Add the reserved basil and plate up. Serve each portion with a slice of lemon. Made this tonight, it was delicious, even my OH loved it. Tasted so authentic.